Since defeating Nikolay Valuev to become World Champion back in November, Haye has become something of a British sporting hero. While heavyweight boxing has been in an increasingly parlous state, Haye may potentially breathe new life into the division. He's a promoter's dream - he's not afraid to talk himself up & has an aggressive style in the ring, always looking to knock out his opponent than win on points. And the fact that women love him does no harm. Also, whilst unfair, the fact that English is his spoken language is also an important part of his appeal. As xenophobic as it is, the fact that the Heavyweight titles were being divvied up between fighters from the old Eastern bloc had been a big turn-off for Western audiences. And Haye has not been slow to capitalise on this new found fame, plenty of television appearances and self-promotion have become a Haye staple. He has made no secret of his desire to unify boxing's Heavyweight titles before retiring, and this means that the Kiltschko brothers (Wladimir & Vitali) are in Haye's cross-hairs. The Ukrainians hold every other global version of the Heavyweight boxing title, and as they refuse to fight each other that leaves Haye as the last viable contender to prevent this era being known as the Klitschko era, which would not be good for the sport as the Kitschko's are the antithesis of Haye; plodding, ponderous & cumbersome, and that's just their interviews. And therein lies the problem, Haye is only fighting Ruiz as the American is the mandatory challenger for Haye's title. Ruiz has barely garnered a serious mention in the build-up to this fight. Boxing is one sport where if you take your eye off the ball for a moment, it can come back to whack you square in the face. Better fighters than Haye have paid the price for not coming into a fight fully focused, and I must confess I am slightly worried that a combination of the new found fame and his discernible desperation to get at the Klitschko brothers could derail Haye's top level career before it's really begun. 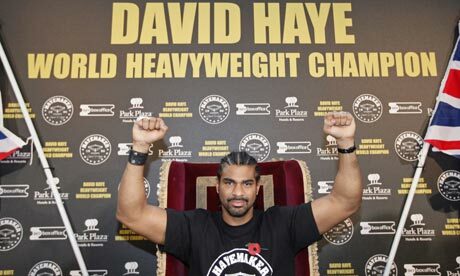 There's no doubt that Haye goes into the fight on April 3rd as favourite. I view him as superior to Ruiz and he should win without too many difficulties. But if he gets ahead of himself, and allows his focus to drift towards future challenges, he could be in for a painful reality check. Every great journey begins with a single step, but if Haye tries to step too far, too fast, he could have the rug pulled out from under him in Manchester. Excellent points well made, I have to say that boxing is not a sport i follow closely but being the avid sports fan I hear enough to agree with your sentiments. Haye does appear top believe that he is the greatest and whil a little arogance can help he seems to be taking everything quite lightly. Best of luck to him as it would be good to have a British fighter be the one to unify the titles. Great post looking forward to reading future posts from you.